Democrat U.S. Sen. Joe Manchin of West Virginia, left, and Republican Attorney General Patrick Morrisey, center, debate Thursday in Morgantown. Hoppy Kercheval of WV MetroNews, right, moderates the debate. MORGANTOWN, W.Va. — With just five days before the Nov. 6 general election, the Democratic and Republican candidates for U.S. Senate had their first face-to-face debate on the issues of the day Thursday. 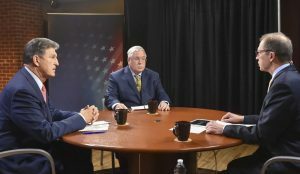 The West Virginia Broadcasters Association sponsored a debate Thursday night between U.S. Sen. Joe Manchin, D-W.Va., and Republican state Attorney General Patrick Morrisey at the studios of Pikewood Creative, the home of WV MetroNews Talkline, in Morgantown. The debate was moderated by Talkline host Hoppy Kercheval and broadcast around the state by radio and television. Kercheval asked the candidates about the tone of political discourse in light of recent news about mailed bombs to prominent officials and a shooting at a Jewish synagogue in Pittsburgh. With both candidates going negative in the last days of the campaign, Manchin and Morrisey agreed both political sides need to come together.